^^Habakkuk's probing dialogue with the Lord of Israel. ^^Zephaniah's warning to Jerusalem's last great king. ^^The texts of these minor but important prophets receive a fresh and penetrating analysis in this introduction and commentary. David W. Baker considers each book's historical setting, composition, structure and authorship as well as important themes and issues. Each book is then expounded passage by passage in the concise and informative style that has become the hallmark of the Tyndale Old Testament Commentaries. 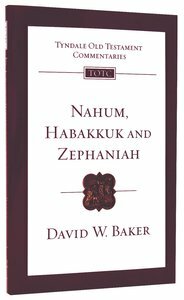 About "Nahum, Habakkuk and Zephaniah (Re-Formatted) (Tyndale Old Testament Commentary Re-issued/revised Series)"
Nahum prophecies the destruction of Nineveh. Habakkuk questions the Lord of Israel. Zephaniah warns the last great king of Jerusalem. David W. Baker examines the authorship, composition, structure and historical context of each book and highlights the authors' major themes. David W. Baker (Ph.D., University of London) is professor of Old Testament at Ashland Theological Seminary and the monograph editor for the Evangelical Theological Society. He is the author and editor of numerous books, including The Dictionary of the Old Testament: Pentateuch, and commentaries on the Minor Prophets for both the Tyndale Old Testament Commentary series and for NIV Application Commentary.